For one thing, I am astounded at what they get away with on network tv. I’m not a big fan of splatter movies, gore doesn’t bother me, but the show is so visceral in its presentation of the violence. You rarely see violence on screen, but the bodies left behind–WHEW. You might remember me mentioning in this post from approximately a hundred years ago that I am a huge fan of the Hannibal Lecter character. I still haven’t seen Hannibal Rising (probably won’t), but a friend kept telling me how much I needed to watch the tv show. It wasn’t on Instant, so I was a good little consumer and bought the first season on dvd. If you aren’t already a fan of horror and aren’t very desensitized to it, you might strongly consider giving this one a miss. I mean the show is so compelling, but seriously – HORRIBLE THINGS. This makes Game of Thrones look like a Disney movie and I have NO idea how they do it! It’s magnificent. It’s perfect. 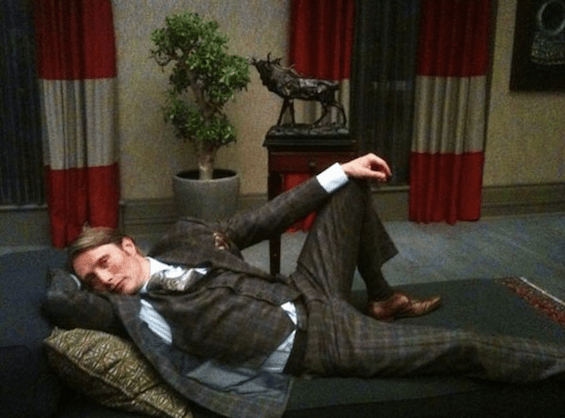 As a portrait of Hannibal Lecter it’s – well it’s not perfect, because the Hannibal of the book is a short, unassuming little man with piercing eyes with red highlights, nothing like towering specimen Mads Mikkelsen. But it works. The show is not trying to recapture the book’s character, and Mikkelsen makes the character his own anyway. He is playing Lecter as completely fallen, sort of pretending that Lecter is Lucifer and inherently evil rather than worrying about any of the psychology behind the character. And it works! So much has already been written about this show and these characters and scenes and symbology and Wendigos and food and plaid suits and so I don’t need to try and plaster my stickers on over everyone else’s. The fandom exists, and by all means go and explore it. I might! I have never written fanfiction before but I just might! Realizing he needs to get his car washed, finding that his normal detailing people are out of town, and having to wash his car himself with cutoffs and a tshirt he got free from the bank. I picture him losing himself in the car care section of Advance Auto Parts pondering which scent to buy. Would he even OWN cutoffs? I mean he makes his own beer, does canning, and a lot of cooking, and I’m sure he does all the maintenance on his murder dungeon himself. I can’t see him sacrificing a good suit while doing all that. Maybe that’s what the killsuit was originally for. Screwing up a recipe because he’s out of that ONE GODDAMN THING that sets the whole thing off and being SO GLAD he was eating alone that night. Quelle dommage! But he has a freezer full of goodies, so he’s all good. … but one kid would try. Oh yeah. Stumbling across a reality show filmed in his city where everyone is horrible and rude and discourteous and he sort of smiles to himself and realizes that if he doesn’t slow down he’ll have to break out the sweatpants from all the people eating lately. And because it’s about food, a subject I hold to be VERY precious, here is the amazing supercut that makes it look like an amazing cooking show. And yes, there are very identifiable people parts. Just rock with the music and pretend it’s veal!